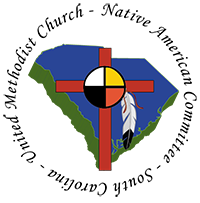 The Native American Committee of the South Carolina Conference of the United Methodist Church was established in 1992 as a ministry of the Advocacy Area. At that time, ministries with the Native American population were almost non-existent. With the organization of the Native American Committee, this virtual ministry was implemented and placed under one jurisdiction. The parent organization of the NAC is the Southeastern Jurisdiction Association for Native American Ministries at Lake Junaluska, which provides training and support. Native American Committee members represent a number of Indian cultures and have a point of contact with other Native communities. Committee members are of Santee, Ojibwa, Cherokee, Wassamassaw, Catawba, Pee Dee and Waccamaw heritage. Promote inclusion of Native Americans in the South Carolina Conference. Explore and implement awareness of and appreciation for Native American presence, history, traditions, and spirituality. Promote Native American Awareness Sunday in this conference and dispense the funds contributed on Native American Awareness Sunday to ministries and community development in this Annual Conference and the Southeastern Jurisdiction. To schedule Native American Ministries Sunday for your local church, contact Tracy Pender at 803-905-5672 or tracypender@hotmail.com.